We are ready to start our 2018-2019 BOM. 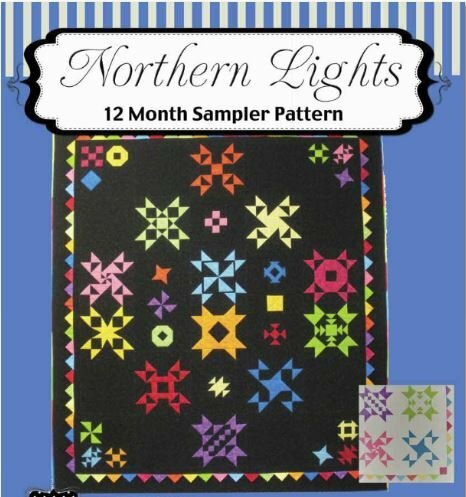 This pattern is called Northern Lights with 12 - 15" sampler blocks and 20 - 6 1/2" sampler setting blocks. Register for this BOM and come to one of our three sessions to get your block kits or pick them up at the shop each month. This year's BOM quilt will use batik fabrics in saturated colors with one background fabric that you will choose and purchase. Our theme this year is "Finish Those UP's" (unfinished project). We love show and tell; ours and yours. This year there will be a drawing each month at each session for a $20 to $30 valued prize. If you bring a completed UP to show, you will get your chance in the drawing. At the end of the year all names will remain in our final drawing for a free long arm quilting service at a value of $120.00. Come joint us for our 2018-2019 BOM on the third Saturday of the month at 10:30am or the third Thursday of the month at 10:30am or 6:00pm.